#WalangPasok ADVISORY: 6:46 AM for August 28, 2014. According to Governor Juanito Victor "Jonvic" Remulla post on his social media account. Classes in All Levels on Cavite Province is suspended for Thursday, August 28, 2014, but he did not give any reason for the class suspension. This is the second day in a row that classes at all levels in Cavite have been suspended. According to PAGASA, the LPA has since exited the Philippine Area of Responsibility. But on Thursday, it was announce that a new LPA may bring rain to parts of Luzon, including Calabarzon (Region 4-A) where Cavite is located. Here was the actual post of class suspension on Cavite by Governor Juanito Victor "Jonvic" Remulla. Bookmark this page or follow us on Facebook and Twitter for easy access. 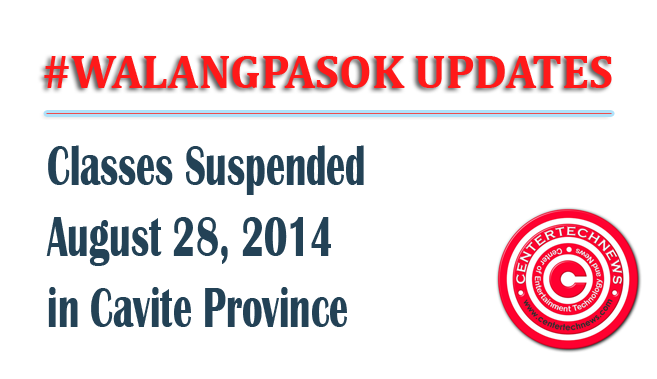 We will post updates on this page if new information were available for #WalangPasok Suspension of Classes for 28 August, 2014 Updates.